There is a trend throughout the years, for backup singers to come out of the shadows and record their own albums. Charmaine, who toured with Australian artist Rebecca St. James for years, released her popular and prolific album Love Reality in 2010, and continues to gain popularity with her music. Backup singer to CCM songstress Natalie Grant, Tiffany Thurston released a 2011 self-titled EP, also to critical acclaim. And with both Charmaine and Tiffany being just some examples of I’m sure many others, here is another backing vocals singer who has released her own material. 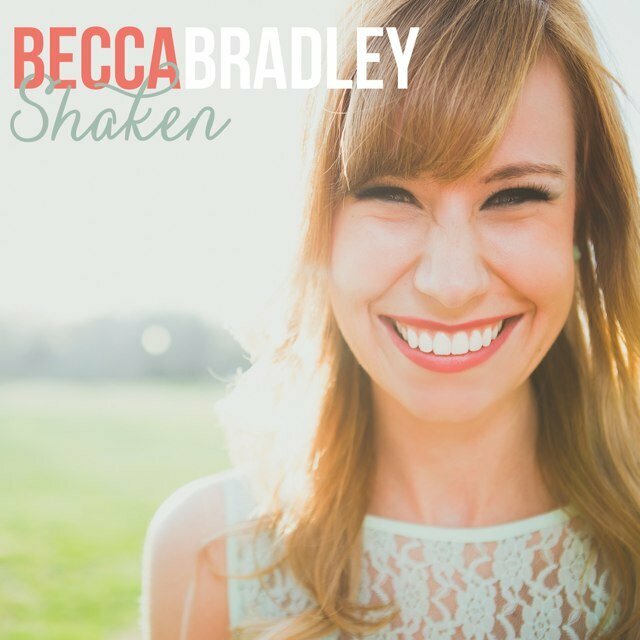 Singing as part of Francesca Battistelli’s live band for the past few years, 23 year old Becca Bradley released her first collection of songs on April 29th 2014. Now how does this new artist compare to the rest of them out there currently from this year? Quality-wise, does Becca have a bright future in music just like Charmaine, and how does her music compare to that of Francesca’s, the music she sings a lot of? As far as EP’s go, Shaken is perhaps one of the most enjoyable pop EP’s since Marie Miller’s You’re Not Alone EP, and one to thoroughly enjoy if you are fan of artists like Natalie Grant, Meredith Andrews or Francesca Battistelli. With the theme of the album to be shaken for the things of Christ, it is through the first track, “Shaken”, that we hear not only what the album is about, but also what we ought ourselves to be about, even now as Christians within a society that encourages us to lean one way or the other. Becca’s trademark cello playing is possibly one of the most unique musical techniques I’ve heard in CCM/Christian pop, and quite frankly, something that sets her music apart from anyone else within the industry currently. Starting off the song with some riveting cello riffs, Becca unveils some of her own concerns, in the poignant words of how ‘…why is it so easy, to get so comfortable, caught up in my own little world?…Father, Father, forgive me now, awake this selfish heart somehow…’, and with a verse like this, we are able to hear possibly one of the most confronting/uncomfortable/equally impacting first song on a pop/CCM album in a while, since “Turn Around” by Michael Boggs. With a country twang to her voice that reminds me slightly of Nika Taylor of Red Roots; “Shaken” is a nice start to an album that’s just as poignant as an indie EP as one would be if the album was produced by a label. The first promotional single on the EP, “For a King and for a Kingdom” slows down the tempo and presents an anthemic ballad that reminds me of something musically arranged like a modern day hymn, presenting us with a song that can be equally sung during corporate, and individual worship settings. With the hymn-like stanza setup, Becca invites us all to travel alongside her on a poignant journey of realising that ‘…for a king and for a kingdom I was called, past the shadows and the shame, Your mercy saw, though my innocence was lost, You restored it at the cross, for a king and for a kingdom I was called…’, with the instruments of the cello, keyboard riffs, light percussion and acoustic guitars all bearing witness as we hear the standout song, and favourite Becca Bradley melody, on Shaken. “As I Lay Me Down”, “Let it Fall” and “The Ocean” are all the remaining tracks on the EP, with each of them continuing to bring to us powerful lyrical moments of hope, surrender and courage as Becca continues to assert herself as one of my favourite new artists of 2014 so far. With an acoustic guitar to bring to life “As I Lay Me Down”, Becca speaks about the topic of surrender, in this easy-to-enjoy toe-tapping melody that is just as easy and infectious to sing, as it is to listen to without realising that we’ve heard this theme before (“Lay Me Down” by Chris Tomlin anyone?). Despite a theme that has been recycled, the song is still as enjoyable as ever, presenting to us a chorus amidst the light acoustics, that show us a prayer of how ‘…every burden will be lifted, every veil will be torn and every part that is broken will be restored, let Your kingdom come, Your will be done right now…as I lay me down…’ “The Ocean” is one of those songs that you think you know because the melody’s so familiar, but then you realise that in fact, you’re hearing the song for the first time. The catchiest song on Shaken, Becca invites us all to take a trip with her into the ocean of God’s love, where we ‘…feel the warmth of Your sunlight and let the tide wash over me…’, and the song becomes one of my favourites on the EP. Ending with “Let it Fall”, a piano led melody that encourages us to yearn for more of God’s presence in the poignant words of how we ought to let ‘…it fall on me, I am ready, Lord I am ready…’; Becca uses the last track for a purpose of us leaving the EP experience longing for more of God and what He longs for each of us. Becca’s first collection of 5 songs is an EP like no other. And to answer the question I posed in the introduction- yes, I do believe that from these collection of songs, Becca’s future in music is as assured as Tiffany’s and Charmaine’s. With Becca having a busy schedule- singing her own music as well as still being in Francesca’s band, it’s only a matter of time before Becca sings on her own as her music continues to impact whomever listens. A great artist to listen to if you are fan of Francesca, or any other pop/CCM music; Becca’s first EP is hopefully one of many to come. Well done Becca for such an inspired and powerful EP. Francesca Battistelli is my favorite musician, knowing that Becca’s Franny’s backup singer makes me eager to want to listen. Thanks for the recommendation Jon.